Maseto teaches her fellow Maasai women to read and write. Many women are seizing the opportunity to learn reading and writing so that they can more effectively buy things and obtain other services at local shops. These shops are mostly owned and operated by non-Maasai. Arkado and our community of Olbalbal on Palm Sunday. Green grass is a sign of reconciliation and peace for the Maasai and is much used in our services. Arkado baptizes a young woman at our outstation of Lorlmunyi. His ability to get around on foot to some of our most difficult places has helped to significantly expand our work. Arkado blessed two marriages in the mountains of Olbalbal. Here are pictured Mika, puts the ring on the finger of his bride. The Maasai are very responsive to the Gospel message. Most Sundays there is a full house. Musa has been with us for a year. He is recovering from months of starvation as an infant. We hope that he’ll soon begin to walk. My home here at Olbalbal is simple but fits us. There are rooms in the sprawling stone structure for Arkadiusz, Matayo, the catechist with his wife and two children, Naponu, a Maasai lady, who lives here with her five children and watches the place when I am away, and a room for me. Just a few feet from my front porch is one the outlets that supply the Maasai of the area with water for drinking and cooking. Sometimes it is very noisy, but most of the time the gathering point provides opportunities for saying hello to people, “to eat the news” and pass the time of day. Maasai use brand their cattle to remind all that these cattle have and owner and must be returned if lost or stolen. At Baptism, we are branded with the cross, signifying that the person is a follower of Jesus and belongs to Him. Here I am teaching the gospel in a Maasai community. The whole community, elders, women and children come together as a family to listen to the gospel. When the time for Baptism arrives, the Maasai community becomes a Christian Maasai Community with all the richness of their language, music and traditions. Out on the plains we have Mass and other meetings wherever people might gather. Here we are at the Christian Community of Olmisigio where there is not even a tree to set under for shade. Notice that my vestments are black, the color of the rain clouds, the source of all good things. Two of my students. Narropil & Lememakua on their wedding day in July of 2010. Lememakua is a Financial Officer for Ngorongoro Conservation and Narropil is a Medical Clinical Officer presently persueing an advanced degree in counseling at Tumaini University. 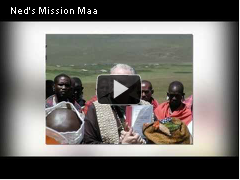 Here Ned is baptizing a Maasai woman. Notice the cross traced on her forehead with chalk. I am baptizing her with water from a gourd sown with sacred cowry shells and stuffed with rich green grass, a sign of God’s love and blessing for the new Christian. Young nurses, recently graduated and placed in hospitals throughout Northern Maasai country, come to visit the mission. We helped these young women in their struggles to get an education and to go on for nurses training. It was a long arduous trek to achieve their nursing diploma. SPECIAL READING: Christ Before Literacy by Ralph J. Poirier, C.S.Sp. Lememakwa: Ngakui, mikinjoo e Nkai ilarin kumok lekishon, tobiko naabik ildoinyo, inoto omo ti Ai o te Maasai. Injuro. Barbara: I am late with the Happy Birthday, but Happy Birthday and many many more! Lememakwa: Hongera Fr. Arkado (Oloodo), tunakutakia mafanikio huko Malambo. © 2019 NedsMission.org – Olbalbal, Tanzania. All Rights Reserved.